This history of streetcar service into the northern reaches of Seattle’s Capitol Hill was about three years in the making. I pieced it together through a general history of the Union Trunk Line, answering a few questions for Paula Becker while she wrote HistoryLink’s Roanoke Park history, gathering stuff to talk about while helping guide two Feet First stairway walks, and finally as an attempt to write a simple chronology of service to the Roanoke Park neighborhood. I’ve embellished that chronology here with a few illustrations and references to city ordinances or other sources for key pieces of information. I hope you find it interesting and useful. In 1891, the Union Trunk Line opened service from Pioneer Square to the hinterlands. UTL had a cable car leading east to the top of First Hill at Broadway and James. From there, streetcars ran in the other cardinal directions: further east to Madrona, south to Beacon Hill, and north to what had until recently been the city limits at Lynn Street. The original streetcar franchise was issued in June 1890 (Ordinance 1411), modified in 1891 (Ordinance 1859 and 1860). Also in 1890 Seattle annexed a large chunk of land including the northern tip of Capitol Hill and land extending far to the north beyond Green Lake. But UTL construction and franchise did not initially extend beyond Lynn Street on 10th Avenue. North of Lynn Street, the area now known as Roanoke Park began being settled in the 1890s, and the oldest remaining home in this historic district dates from 1899. Below is a photograph of it by Joe Mabel on Wikimedia Commons. “Seattle – 2736 Broadway E 01” by Joe Mabel – Photo by Joe Mabel. Licensed under CC BY-SA 3.0 via Wikimedia Commons. The area was so different in the 1890s, it’s really hard to imagine. For example, Eastlake Avenue was not cut through until 1893. 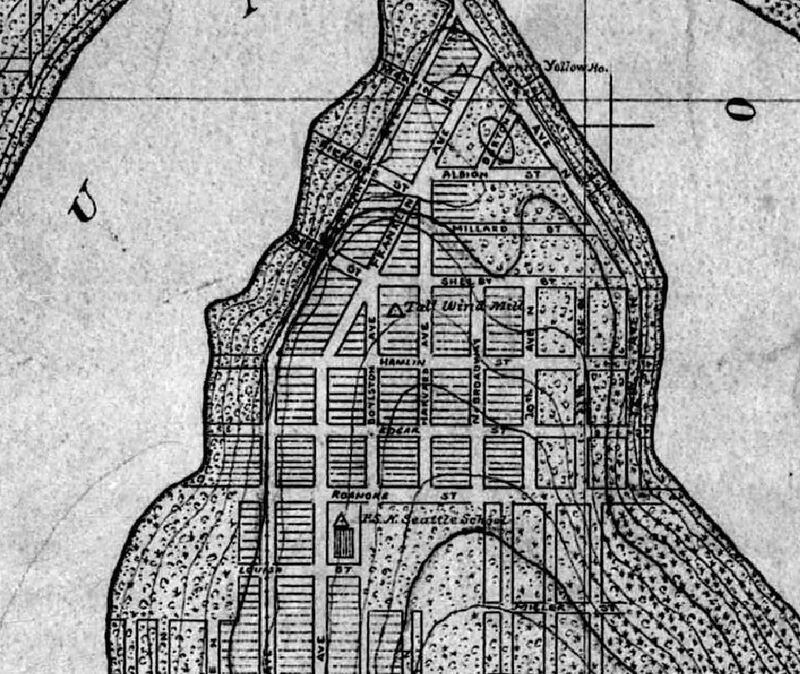 The bridge across Lake Union in 1891 was to the west, connecting with Latona. The predecessor to today’s University Bridge, in the same alignment, was already in place in 1899 but known as the Brooklyn Bridge. In 1899 the Union Trunk Line was sold to Seattle Electric Company. SEC went on to purchase almost every streetcar line and system in Seattle, and UTL was one of the few that had never entered bankruptcy prior to acquisition. SEC replaced narrow-gauge tracks with standard rails so that cars would be interchangeable with other lines. In 1903, after the completion of the Pike Street regrade, SEC restructured the Union Trunk Line routes, with the Broadway Line running from Pioneer Square up to Pike Street, then around First Hill to Broadway and out to Lynn. North Broadway residents would no longer have to transfer to a cable car on Madison or James to get into town. Suddenly the empty land would get names through developments like Capitol Hill and Roanoke Park. In September 1905 SEC finally decided to extend the line north to meet with streetcars on Eastlake running out to the University of Washington and other destinations (Ordinance 12828). They were taking advantage of an opportunity and responding to a threat. The opportunity was the regrade of Harvard Avenue. During 1905 the city established a plan to regrade Harvard Avenue from Roanoke to Franklin Street (March, Ordinance 12187) and Lynn to Roanoke (October, Ordinance 12914). Regrades took the natural terrain of a street and flattened it into a continuous slope. The city was targeting horse-drawn wagons and carriages, but these roads became perfect for streetcar use as well. This provided the spark for Roanoke Park development. Two-thirds of the extant historic buildings were constructed between 1906 and 1910. The impact of the streetcar connection north and south, with no long, steep walk to catch a trolley, can’t be overstated. Preparing to move massive crowds for 1909’s World’s Fair, SEC directly connected the Broadway line to the University of Washington campus in late 1908 (see Seattle Times 1908 10 23 page 1). The Broadway line was sold to City of Seattle with the rest of the former SEC system in 1918. Just over twenty years later Seattle converted all of the streetcars to buses. Fast forward through conversion to a countywide bus system, and this continues to operate today as the Metro 49.